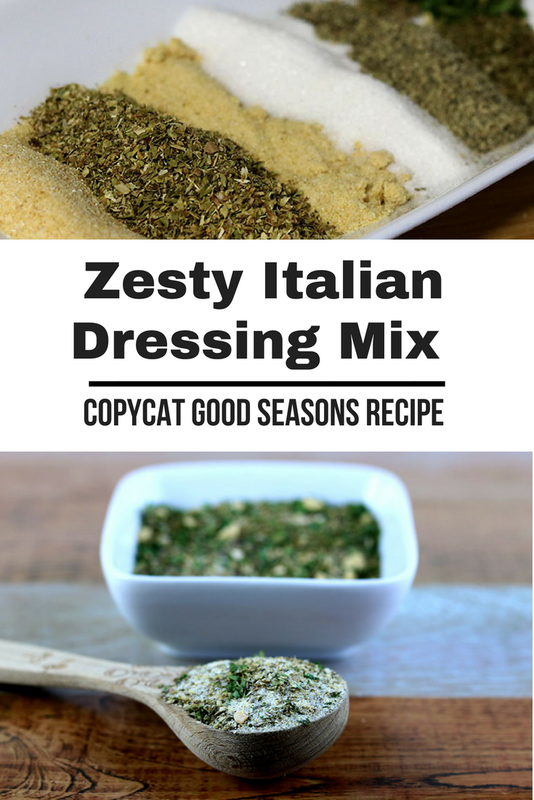 Save money with this copycat Good Seasons Italian Dressing Mix recipe. During the summer, I go through a lot of Italian dressing. We use it on salads, in marinates, and for other summer recipes. Even buying the packets and making my own was getting expensive. I do buy generic, but there's just something about a good Italian dressing that most generic brands don't have. I started making my own copycat Good Seasons Italian Dressing Mix recipe because it's much more economical. I grow some of my own herbs, or I get them in bulk at an Amish bulk food store. Even when I buy my herbs and spices, they are so much fresher than what is in the store. This makes all of my food taste better. In the summer, I practically live on salads. We have a garden, so I'm always picking right from the garden to serve with dinner. I use Italian often because it's light. I like the vinegary taste versus using a creamy dressing. I also use Italian dressing as a quick marinade. One of my kids' favorite summer foods is Italian dressing marinated chicken on the grill. I made it last weekend, and it was all gone that night! Another great way to use Italian dressing for a quick side dish is to cut up fresh tomatoes, cucumbers, and onions. Cover with Italian and let sit for a few hours. In the summer, I like making sides early in the day, so this is perfect. I use this dressing for pasta salad. I boil whatever kind of pasta is on sale, cut up a bunch of veggies, pour over the dressing, and let it sit in the fridge. Again, super easy, and I can make it early in the day to free up my evenings. For zesty oven baked chicken, combine 2 tablespoons of this Italian dressing mix with 1 cup of breadcrumbs. Use that to coat your chicken. Yum! This can also be used a rub for chicken, but I haven't tried it yet. It sounds delicious though. Combine all ingredients. Use the garlic if you like a lot of garlic. I used it because I use this mainly as a marinade. For a zesty Italian dressing, add the red pepper flakes. I typically do not add the red pepper flakes. Store in an airtight container. I use a mason jar with a plastic reusable lid. To make salad dressing, combine 2 tablespoons mix with 2/3 cups oil, 1/4 cup vinegar, and 2 tablespoons water. Mix well. Shake before each use. If you make a lot of salad dressings, these bottles are nice. There are lines so you can add the ingredients without measuring. There are 8 different recipes measurements. This zesty Italian dressing mix is easy to make and tastes delicious. 1. Combine all ingredients.2. Store in an airtight container.3 To make salad dressing, combine 2 tablespoons mix with 2/3 cups oil, 1/4 cup vinegar, and 2 tablespoons water. Mix well. Shake before each use.